Every child likes food and fun, so combining the two is a great way to have a fun-filled party. Whether your child wants to host a Halloween, Christmas, birthday or Valentine's Day party, you can still make cooking the primary focal point. These are just a few recipes you could use at the kids' cooking party. 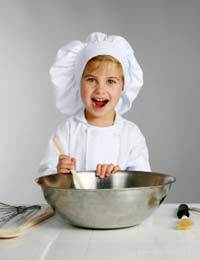 There are many other recipes available on KidsandCooking so why not have a browse through those too and let your imagination run wild. Wash your hands, and get stuck in! Here is an easy and fun way to make your own chocolates. While the sweets are cooling, have the children decorate small boxes (collect beforehand) to place them in. Buy tiny baking cases and place a chocolate in each one. Place chips and condensed milk into microwaveable bowl for two minutes. Take out and have children stir carefully (it will be hot), then place back in the microwave. Keep stirring at one-minute intervals until fudge is creamy and thick. Have children help pour into greased 8in pan, then cool. Once cool, cut into small pieces and serve as desired. Heat the oil in a large pan over a high heat, add the onion and cook for 2 minutes then add the garlic and mushrooms and cook for a further 2 minutes. Next add the beef to the pan and cook for 5 minutes, or until cooked. Then add the oregano and cook for 3-4 minutes. Now it's time to make the white wine sauce. Melt the butter in a pan over a medium heat, stir in the flour and cook for 1 minute. Stir in the milk slowly and keep stirring until the sauce boils and thickens. Simmer for 2 minutes then stir in the ricotta until smooth. Preheat the oven to 200 degrees C gas mark 6. Place a third of the pasta over the bottom of an ovenproof dish and spread half the beef over the top. Next place another layer of pasta and spread the remaining beef on top. Then place your final layer of pasta on top, top with the white sauce and sprinkle with cheddar cheese and bake for 30 minutes. Heat the oil in a saucepan over a medium heat, add the corn and cover with the lid. Cook for 5 minutes or until the pooping stops, shaking the pan occasionally. Place the popcorn into a large bowl. Place the sugar, butter, honey and cream in a pan. Stir over a medium heat, do not boil, until the sugar has dissolved. Then bring to the boil and boil without stirring for 5 minutes. Pour the caramel over the popcorn and mix to together, leave to cool then rub your hand with some oil and mould the popcorn into small balls, and leave to set on a wire rack. Write invitations on recipe cards. Don't try to do too much – one main course, one side and one dessert is enough. Have adults cook on the stove or oven but encourage the kids to help with preparation. You may need an extra adult hand or two to pitch in. Buy each guest an inexpensive pinny as a going-home present (instead of party bag). Or buy cheap aprons the kids can decorate with canvas paint as a party activity while food is cooking. Get paper chef's hats in advance from a catering supply store, make smaller for smaller heads. The list of possible kids' cooking party ideas is endless. Have a Breakfast Brunch party, serving bacon, eggs, pancakes, waffles and blueberry muffins, which are all easy for children to prepare. Or have a scary Halloween party, serving jacket potatoes with a variety of fillings the kids can make themselves, scary soups and revolting desserts such as Chocolate Slime and Bloody Vampire Cupcakes. With a little imagination, anything's possible!